CAD-neutral. Solver-neutral. Cost-effective. 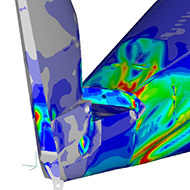 The world’s most popular engineering analysis environment for Nastran users. 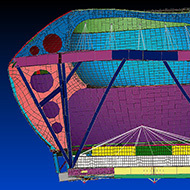 Please select the FEMAP licenses you're interested in and we'll get back to you with a competitive quote that includes the best FEMAP support available. NOTE: Our support & quotes are for the U.S.A. only. A license server allowing a user to check out access to FEMAP either onsite or via VPN. 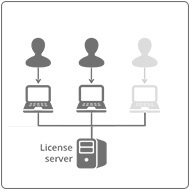 Floating Licenses have advantages in flexibility and accessibility. 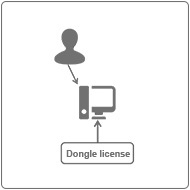 The license is accessed via a hardware dongle (USB stick). As a rule of thumb, Node Locked licenses are lower cost than Floating Licenses. Includes FEMAP standalone pre- and post-processor for geometry import, creation and idealization, FE model meshing and setup and post analysis results viewing. CAD and solver independent and leverages Siemens PLM Software’s Parasolid modeling kernel that allows direct access to Parasolid data for surface and solid modeling in addition to advanced geometric tools necessary for accessing non-Parasolid geometry. From advanced beam modeling, mid-surface extraction and hex meshing to robust CAD import and idealization, FEMAP gives you unparalleled model control and flexibility with a broad range of loads, materials, analysis types with extensive visualization and postprocessing options. The FEMAP with NX Nastran base module includes the core subset of NX Nastran solver functionality fully supported within FEMAP modeling environment and includes a robust suite of linear statics, normal modes, buckling, basic nonlinear, and heat transfer capabilities. This base module provides you access to a broad library of finite element types and material models, robust manipulation of load cases, along with several efficient solution sequences for linear statics analysis (including buckling) and normal modes analyses on models of unlimited size. 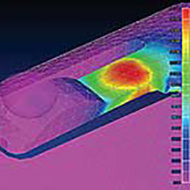 The heat transfer capability provides solutions to steady state and transient thermal analysis and design problems. The basic nonlinear capabilities include nonlinear static and transient analyses that include large displacement and nonlinear material analysis as well as gap and slide line contact. FEMAP with NX Nastran Dynamic response enables you to calculate your product's forced dynamic response to inputs (loads or motion) that vary with time or frequency, as well as compute complex eigenvalues. An add-on option to the FEMAP with NX Nastran base module, it complements the linear static capabilities found in the Basic solution. The capabilities included in the Dynamics module include transient response – the dynamic response of a structure over a period of time, and frequency response, the response of a structure across a range of frequencies. 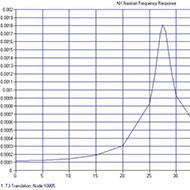 In addition response spectra determination and application, random response and DDAM (Dynamic Design Analysis Method) - a method of shock spectrum analysis largely employed by the US Navy that can be used to determine the dynamic response of a component on board a ship or vessel subjected to shock loading caused by a sudden movement of the vessel due to a phenomenon such as an underwater explosion. The NX Nastran Advanced Nonlinear software solution enables you to analyze models with nonlinearity from contacting parts, material nonlinearities and/or geometric nonlinearities (that is, large deformations).An add-on module of NX Nastran – Basic, the Advanced Nonlinear solver is an integration of the well-known and highly regarded ADINA solver into NX Nastran as Solution 601 for implicit solutions or Solution 701 for explicit solutions. The integration of the ADINA solver into Solution 601/701 is transparent to the user because the input and output formats are based on NX Nastran formats. Thus, to the user, the experience and usage of Solution 601/701 is completely Nastran-centric.